Some days ago many web pages starts to talk about Here for Android (beta) application. So I had to check what this experienced provider can offer. Here really isn't a newcomer, they were known as Ovi Maps and Nokia Maps before. In last two years they start to prepare a new design - on web and on mobile platforms. I dislike their maps until some months ago, but I must confess that their big effort (new design, using some local map providers, simplify user corrections, introduction of live traffic in small countries (Slovenia for example)...) now shows first results. On mobile platforms, Here provides services to Windows Phone, but low market share has made Nokia to devote to Android and iOS. Here app for Android is still in beta version, so I won't be very strict. Beside this, I didn't drive a lot with it until this post and I can miss something. + Clear and nice user interface. + Very good and accurate maps. + Live Traffic integration (even for Slovenia!). + Phone wasn't hot after navigating with this app. This can mean that application isn't a big resources eater. + Map and driving mode are separated. This is maybe strange for someone, but it offer really fast and good map looking with some different layers (satellite, traffic...). - Pretty good route planning - this was usually the biggest problem with Here maps, so I have to be careful with this point. UPDATE! (some hours later): I have changed evaluation from plus to minus after I have driven some hours on different locations. Simple too much problems, bad decisions and wrong roads. It is interesting that route planning on the web is different from that on phone (with same route settings of course). Maps also aren't as good as maps from Google or TomTom. - Some maps are abnormal big. 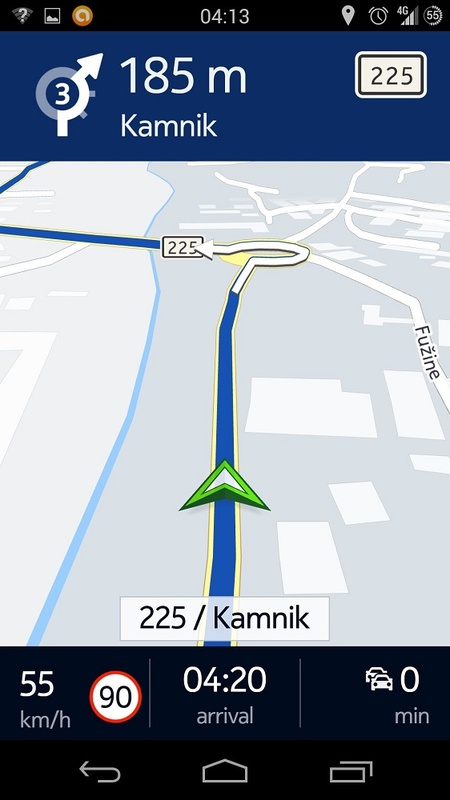 For example - Slovenia map uses 288 MB on this app. Latest Slovenia map for IGO from the same provider uses only 10 MB. I can see that they included individual building on map, but if I compare it with similar IGO map, it is still ten times bigger.This can be a beta version problem or maybe satellite view is included in it (I didn't have time to check). - Strange icon on roundabout (look at screenshot) - it says third exit and is show like the exit is on the right side of roundabout. The reality is just opposite from that - you can see it on map bellow (on screenshot). - Car position is late sometime. Not always, but when it is late, it is quite a bit. - Missing second maneuver when driving. - You can't insert waypoints, just a destination. - Incomplete cloude solution. User can work with web version, but prepared trip won't be available on the phone. - Searching for POI sometimes don't work as expected. It is also strange, why it goes to web if I select offline using before. - I expected more application settings. To be honest - it looks very promising and I'm waiting to buy a final version. If only Here developers can solve problems with bad route planning. Nokia’s Here should be landing for Samsung Galaxy devices shortly, with support for other Android devices to follow by the end of this year. The price is still blowing in the wind. Fernback (Senior Vice President at Here division) says: "I want the focus to be on building a great product and build a big user-base, then we can talk about how we might want to monetize." (TheNextWeb). Does this mean that Here app will be free? Their big competitor is (free) Google Maps... so it is possible. We will see this very soon. Where did you find the beta? Can we have a link? I'm not sure, if I can publish an APK file. Or try with searching on the net. What do you think of OsmAnd maps? Are a good alternative?